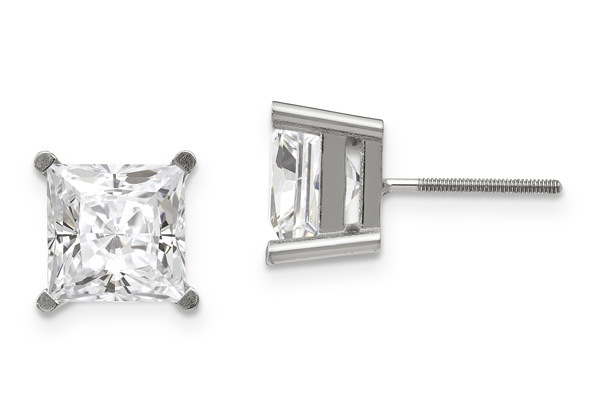 Stunning, brilliant-cut 2.36 carat princess-cut moissanite stud earrings crafted in pure 14k white gold and set in a traditional 4-prong basket-setting, from Apples of Gold Jewelry. Each moissanite stud earring is set with a brilliant-cut G-H Color, 6mm square 1.18 carat moissanite stone for a total of 2.36 carats for the pair. Our moissanite stud earrings are handset in the United States. Please allow 4-5 business days before shipping. Also available in yellow gold and varying carat sizes, shown below. We guarantee our 2.36 Carat Princess-Cut Moissanite Stud Earrings in 14K White Gold to be high quality, authentic jewelry, as described above.